Whatever you're looking for in a holiday, you'll find it in Morocco. Discover bustling souks, amazing food, exhilarating activities or just pure relaxation on a holiday to the jewel of North Africa. 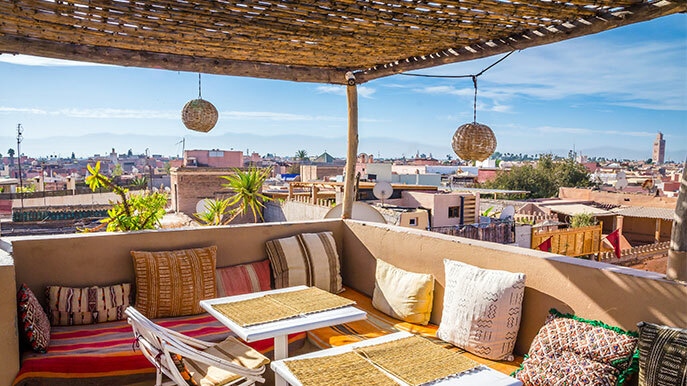 Bustling Marrakesh is a city break with a difference. Indulge in some holiday retail therapy at the medina's souks; get ready for sensory overload as you browse the fascinating stalls of spices, leather goods, brightly coloured pottery, food and jewellery. Chill out with some Moroccan mint tea at a traditional cafe, then dive in again. Be ready to bargain - it's the norm here. The vibrant port city of Agadir is the gateway to a Moroccan beach holiday that's as relaxing or active as you are. Flop on Agadir's five-mile-long beach, try surfing, hike to the historic kasbah or take a day trip to Paradise Valley - it's up to you. The coastal city of Casablanca shares its name with a classic of black and white films, but it’s got far more colour than anything from Hollywood’s golden age. Visitors to Casablanca can discover one of Morocco's most beautiful mosques, gorgeous art deco architecture and a rapidly expanding art scene, with some of the best street art in Morocco. Casablanca also boasts a lively nightlife with a number of bars, clubs and music venues, frequented by tourists and locals alike.